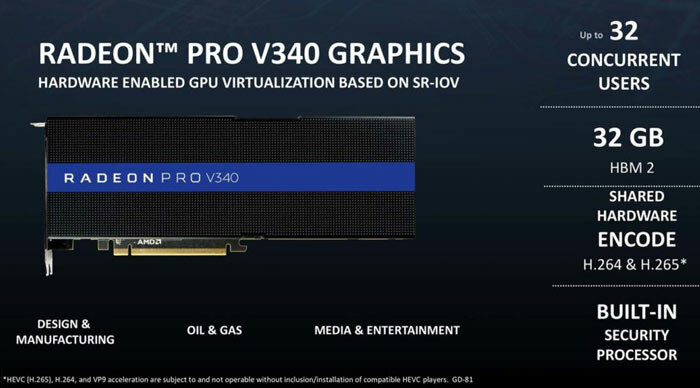 A slide purporting to be from a presentation concerning the AMD Radeon PRO V340 graphics card has been shared online. The Chinese sourced slide wasn't part of the official press deck shared by AMD at Computex, where it showcased 7nm Vega GPU and announced the 32-core Threadripper CPU. Thus please take the slide and info on it with a pinch of salt. Above you can see the slide in question - and it does raise some questions… On the surface we can see that the V340 packs in 32GB of HBM2 RAM, enough for 32 concurrent users. The slide suggests the card will be great at video editing / streaming and taken up by design & manufacturing, oil & gas, and the media & entertainment industries. Also good for an enterprise product is the built-in security processor. The biggest question arising for the slide is the missing information regarding what GPU it is based upon. Initial reports accompanying the slide suggested that the AMD Radeon Pro V340 would come packing a 7nm Vega 20 processor. However digging through drivers and GPU codenames, Videocardz reckons it is powered by dual Vega 10, each with 16GB HBM2. The card codename, present in drivers already available from AMD is AMD686C.4 = 'AMD Radeon Pro V340 MxGPU' "which means multi-GPU solution," asserts the video card leaking specialist. Therefore, in simple terms you could think of the as yet unannounced Radeon Pro V340 as a doubled up version of the Radeon Vega Frontier Edition, product pictured above. Question: is the power of vega architecture comparable to PASCAL if the dies are to be manufactured on the same process node at TSMC and have the same number of shaders?